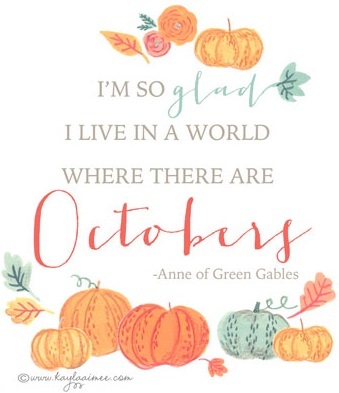 I adore October as it’s the last of the sunny, dry days in the Pacific NW. Come November, the long rainy winter begins and we start needing waterproof clothing and shoes on a daily basis. Waterproof gear for children is often made with PVC (the “poison plastic“) so I’ve gathered together some really cute PVC free options to put on our kiddos this winter. Western Chief : My kids have worn these coordinating boots and raincoats for years (they carry umbrellas, too). The boots are 100% waterproof, natural rubber boots and have a non slip sole. The raincoats are made of 100% polyurethane shell and polyester/cotton lining. There are dozens of darling patterns like lady bugs to popular characters (see Batman, Hello Kitty, Spiderman above), horses, frogs, flowers, and other classic designs. They also make boots for teens and adults. 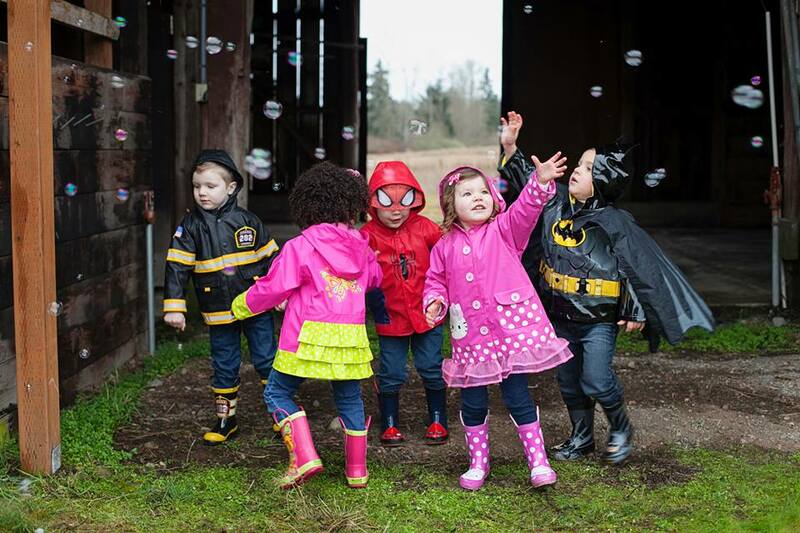 Hatley : The Hatley line of raingear includes rubber boots made of 100% latex rubber with a cotton lining and their raincoats have a 100% polyurethane shell and polyester terry lining. 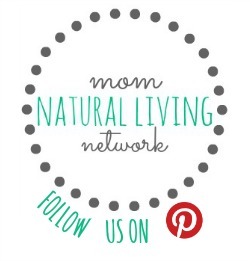 Classic designs include apples, horses, dinosaurs, helicopters, unicorns and many more. Solid colors also available. 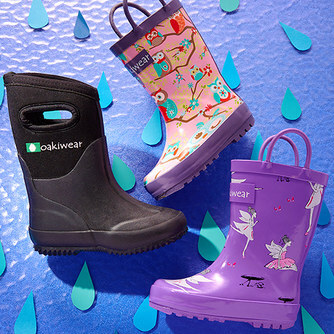 Oakiwear : This local-to-me company offers outdoor gear for kids: 100% rubber rain boots, neoprene muck boots, and a one-piece waterproof rain suit. The rain suit is their #1 selling item and I can see why. 100% waterproof, PVC-free, reflective tape: it’s the perfect off-season outfit for kids. 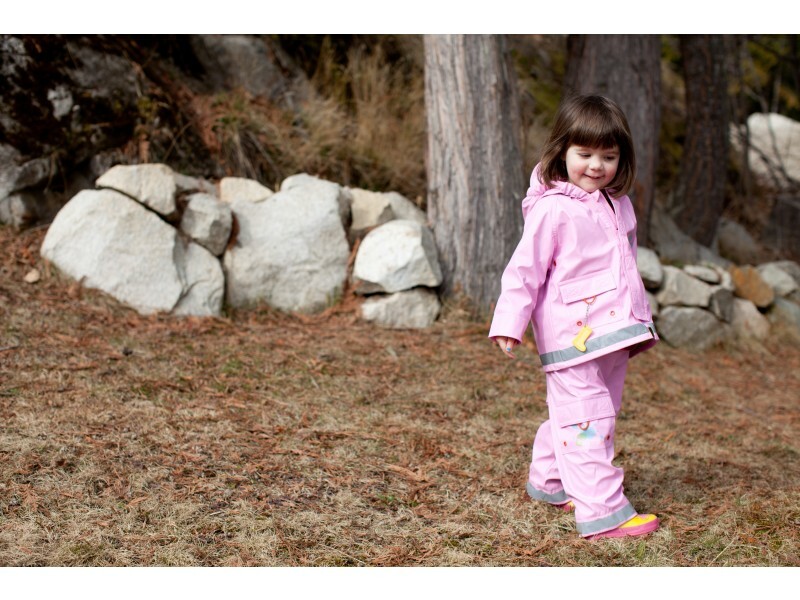 Kushies : The hooded rain jacket and pant set is sized for kids ages 1-3. The visor on the hood is a nice detail to keep rain off a little one’s face. Made of PVC-free vinyl and lined with cotton, comes in 6 colors. For teens and adults looking for stylish PVC-free rain gear, check out Chooka, Hunter, Kamik, or Joules. Kamik boots are actually made with PVC. Due to conflicting info I found on-line, I contacted the company directly and they confirmed this. Bummer, they are really the only boots that fit a narrow kids foot.